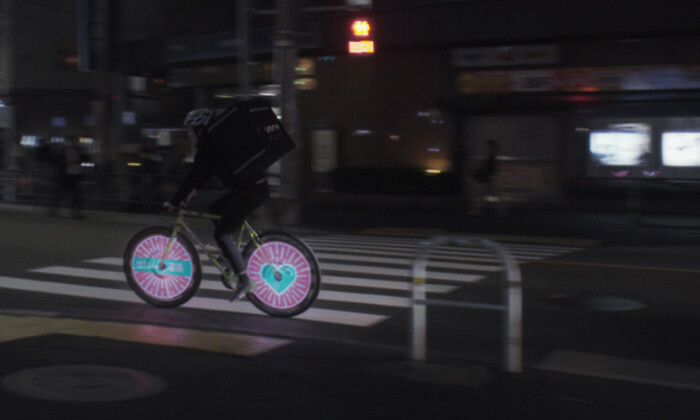 Ogilvy Japan has just launched a road safety campaign – “Safety Spokes” – using UberEATS bikers as the main media. The goal was to raise the brand’s profile in an innovative way and at the same time encourage more consideration towards cyclists. The safety of its bikers is paramount for UberEATS, the brand said. By equipping UberEATS bikes with a Gyrokinetic LED system, each wheel was transformed into a digital screen that comes to life once the bicycle is in movement. Three different safety messages are glowing on the streets of Tokyo: “See Me”, “Give me Space”, and “Care for Me”. Using an animated character and colours inspired by the cautionary road signs of Japan, these wheels call for attention on the road and raise awareness for bicycle safety. The campaign was done in partnership with Eyes Japan, a Fukushima based tech startup. With limited resources and a smart use of digital technology, the UberEATS “Safety Spokes” campaign will be seen all over town in the coming months and hopefully the roads will get a bit safer with each delivery of each meal.